This special issue on rule of law decay addresses a range of issues prompted by recent developments in Poland, Hungary and elsewhere: How to conceptualize rule of law decay? What are its characteristics? How can it be explained? Can it be detected at an early stage? What is the methodology of undermining the rule of law? What, if anything, can outsiders, especially the EU, do to counter this decay? What lessons can be drawn for demands imposed on candidates by the EU in future enlargement rounds? However, in the summer of 2012 a crisis in Romania was more or less averted, while Hungary was dismantling the rule of law with breathtaking speed after Fidesz’s electoral victory in 2010.2 And in late 2015, after the victory of the PiS party, Poland surprised both domestic audiences and outside observers with a well-planned and comprehensive attack on the independence of the judiciary and the media.3 The year 2009 now seems a long time ago. On 22 November 2017 we organized a workshop and a public debate to reflect on the rule of law decay in Poland in De Balie in Amsterdam.4 We planned a special issue of the HJRL with papers by Marta Bucholc, Gabor Halmai, Radek Markowski and Wojciech Sadurski. Later, we asked Gábor Attila Tóth to complement the collection by reflecting on constitutional markers of contemporary authoritarianism. But as these papers were being reviewed and published online, other, unsolicited papers kept coming in which were thematically so closely related that it seemed unnatural to keep them out of the issue. So papers by Tom Gerald Daly, Bogdan Iancu, Lisa Louwerse and Eva Kassoti, and Oliver Mader were incorporated. The collection addresses a range of issues prompted by recent developments in Poland, Hungary and elsewhere: How to conceptualize rule of law decay? What are its characteristics? How can it be explained? Can it be detected at an early stage? What is the methodology of undermining the rule of law? What, if anything, can outsiders, especially the EU, do to counter this decay? What lessons can be drawn for demands imposed on candidates by the EU in future enlargement rounds? Democracy and the rule of law are almost universally regarded as the only legitimate form of government, both vis-à-vis citizens and other states. Hence, as Gabor Attila Tóth notes, ‘authoritarians are under pressure to pretend to be democrats’. This is one of the reasons why there are now so many political and academic concepts to refer to authoritarianism masked as constitutional democracy: illiberal democracy, abusive constitutionalism, democratic rot, abusive constitutionalism etcetera. The special issue commences with an introduction by Tom Gerald Daly into the landscape of this rapidly expanding ‘conceptual bazaar’.5 He argues that the emerging field can best be termed democratic decay, which he defines as the incremental degradation of the structures and substance of liberal democracy.6 Daly claims that democratic decay is a new research field in its own right, just like transitology and consolidatology, with a research agenda which comprises such items as the discovery of patterns and stages of democratic decay, of subtle and less subtle methods deployed, and of early warning signs that the health of constitutional democracy is in danger. Gabor Tóth, who also discusses the rich vocabulary of the ‘new transitology’, pursues this last line of inquiry in his article on Constitutional markers of authoritarianism,7 thus presenting an answer to the question formulated by Renata Uitz a few years ago: Can you tell when an illiberal democracy is in the making?8 He shows that there are various visible and less visible markers: a pseudo constitution; hegemonic voting practices; claims by the majority party to represent ‘the people’ instead of a part of the electorate; an imitation of institutional checks and balances; a superior executive with broad and ill-defined powers; and restrictions on fundamental rights. Wojciech Sadurski dissects the methods used by PiS to dismantle the independence of the Constitutional Tribunal, which started the PiS ‘reform’ of the judiciary.9 There was an obvious reason why PiS started with the Tribunal: it could invalidate laws adopted by the new majority (and was thus able to play an important role as a counterbalance) and it could protect fundamental rights. But when turned into an instrument of the parliamentary majority, it can also ensure that legislation can be introduced without serious questions being asked. The PiS strategy was a combination of downright illegal acts (for example the government’s refusal to publish unwelcome judgments, thereby deniyng them any legal effect) with the quasi-legal introduction of ordinary laws which de facto changed the Constitution. This amounted, as Sadurski has put it elsewhere, to a ‘constitutional coup d’etat’.10 Sadurski notes that the Constitutional Tribunal was a relatively easy target because it was the only body entrusted with constitutional review. ‘With hindsight, it would have been more difficult for them (PiS) to succeed had a legal culture been generated under which all judges, low and high, could refuse to apply a statute they deemed unconstitutional’. Indeed, no constitution or rule of law arrangement is ‘a machine that would go of itself’, as Kammen once put it,11 and any functional constitution should at least to some extent be backed up by the legal culture in which it functions. The importance of culture is also discussed by Marta Bucholc, though in a different way when compared to Sadurski. Where he focuses on how law and institutional arrangements might be conducive to a rule of law culture, she shows how PiS has subverted this rule of law culture itself, especially by shaping and managing collective memory and perceptions. In her exploration of the cultural dimension of rule of law decay, Bucholc identifies the use of bricolage, retouch and re-stylization techniques. For example, the Polish Constitution of 1997 has in recent years been discredited by framing it as a mutation of communism. The attack on the Constitutional Tribunal was thus presented as an instance of restorative justice aimed at abolishing the last remnants of communism. Bucholc also described how measures against the judiciary have been accompanied by unrelenting media coverage of the failures of the court system, including corruption and miscarriages of justice. Propaganda is also a theme in Radek Markowski’s analysis of the causes of the electoral victory of PiS in 2015 and its subsequent attack on the rule of law. Markowski emphasizes that the 2015 PiS victory was not a landslide but an ‘electoral accident’: only 18.6% of the eligible, or 37.5% of the active voters supported PiS, which, due to election laws, turned out to be just enough for a 51% parliamentary majority. Interestingly, there is no evidence of a popular or electoral demand for the radical measures that PiS have taken since 2015. Recent events in Poland are rather ‘a classical supply side nationalistic/authoritarian/conservative revolution’. Yet the revolution is puzzling: PiS was already a well-established (opposition) political party when it came to power. Its insiders, representatives and leadership had benefitted from access to state resources, public sector jobs, democratic security, and relative prestige among part of the population. Why would they choose the radical and even hazardous attack on the Constitution and the judiciary? And why would a part of the electorate support the recent illiberal turn? Markowski offers a series of tantalizing ideas. The most striking one is that democratic decay is not the result of the legacy of Polish ‘Homo Sovieticus’, as many have claimed. Rather, a legacy of the subversion of communism through ‘adaptive resourcesfulness’, including support of the Catholic Church, have contributed to dispositions unconducive to trust in institutions and constitutional democracy. Oliver Mader offers a thorough exploration of the foundations and modus operandi of rule of law enforcement in the EU. One of his arguments is that a rule of law culture would be fostered if the CVM (Certification and Verification Mechanism) were extended to all Member States. The CVM was introduced in 2007 when Bulgaria and Romania acceded to the EU. It was meant as a transitional measure—it still exists!—to assist both countries in making further progress in judicial reform and the fight against corruption and organized crime. According to Mader, the regular, evidence-based monitoring which the CVM provides could give a more objective and reliable underpinning to other existing and proposed mechanisms to enforce the rule of law. Gábor Halmai explores another avenue, which has been widely discussed by politicians and policy-makers over the past few years: financial conditionality and financial penalties. ‘This’, former Commissioner Viviane Reding has said, ‘would be the most effective way to influence the behavior of a government like the Polish one—making a link with the money. It is the only thing they understand’. Halmai does not focus on the 2018 Commission proposal for a regulation to protect the Union’s budget in the case of generalised deficiencies as regards the rule of law in the Member States,15 but on the Common Provision Regulation which regulates the European Structural and Investment Funds. According to Halmai, this Common Provision Regulation requires Member States to uphold the rule of law. It can be used to suspend funds. And it does not require the hurdles of a 4/5 majority or the unanimity of Article 7 TEU. Halmai is aware that such measures are controversial, because ordinary citizens, not their authoritarian governments, would suffer most. Nonetheless, the dependence of the governments of Poland and Hungary on the aforementioned funds is significant, and as such suspending funds may also embolden the political opposition. This idea seems to be convincing to many. On January 17, 2019, the members of the European Parliament voted, with a 397-158 majority, in favour of draft rules to suspend EU budget payments to the countries jeopardising the rule of law in their countries. More specifically, under the proposed rules, which were first tabled by the EU Commission in its long-term EU budget plans, governments interfering with courts or failing to tackle corruption will especially risk the aforementioned suspension. To be sure, these rules will still have to be negotiated with the member states. In any event, on the same day, the European Parliament tripled the proposed EU budget—from 642 to 1834 billion Euro—for promoting democracy, the rule of law and fundamental rights. Funding civil society organizations is an important part of this promotion plan that was approved with a 426-152 majority. Less well studied is the role of the Council of Europe, especially the so-called Venice Commission (officially: the European Commission for Democracy through Law). This Commission is the subject of the article by Bogdan Iancu. The Venice Commission is an expert body of the Council of Europe, consisting of representatives, especially senior academics, supreme or constitutional court judges or members of national parliaments, of the 47 member states of the Council of Europe, and of 13 other states. Its primary task is to assist and advise individual countries in constitutional matters, in order to improve the functioning of democratic institutions and the protection of human rights. Iancu describes the increasingly important role of the Commission in in cases of rule of law decay. He praises its contribution to providing guidelines and information to post-communist democracies. But his article has a strong critical focus, dealing with its methodological and procedural deficiencies, leading for example to inconsistencies across country opinions. Iancu particularly mentions the ‘arguments from authority’ (referring to itself as the ultimate source of wisdom) sometimes used by the Venice Commission, these ‘being a last line of defense in common logic and constitutional theory alike.’ All of these deficiencies carry the peril of subordinating constitutionalism to instrumental considerations, which, although different in their degree and purpose, are not too different in kind from the constitutional instrumentalism of populists in Hungary, Poland or Romania. This might well result in an erosion of the Venice Commission's credibility, which is a missed opportunity in times when we are in urgent need of stable constitutional limits and distinctions. It is not at all self-evident that the EU’s accession policies are responsible for recent rule of law decay in Hungary and Poland. For one thing, the rule of law appeared to be fairly robust in Hungary before 2010, and in Poland before 2015. As Markowski points out, there was no demand for the attack on the judiciary which PiS carried out after the elections (but the fact that the Hungarian and Polish parliamentary majorities went to great lengths to dismantle the judiciary is of course proofthat the judiciary was a serious check on the exercise of their powers). Moreover, the post 2015 reforms are as much the result of domestic processes as they are the result of accession conditionality. Indeed, not all countries in Central and Eastern Europe which acceded in 2004 are witnessing rule of law decay today, at least not to a degree comparable to Poland and Hungary, and this variation is hard to explain if accession policies are an all-determining factor. Even so, the EU and some scholars have for a long time credited accession conditionality as an important and effective incentive for political transformations. So even if this accession policies are not an all-determining explanatory factor for rule of law decay, recent events in Poland and Hungary may call for a re-examination of the methodology of EU accession policies. The question, in particular, is whether the Commission’s operationalization of the Copenhagen political criteria has taken sufficient account of the fact that the rule of law not only depends on rules, procedures and institutions, but also on a shared understanding among the main political actors that these rules deserve to be respected, even if it is relatively easy for a majority party to ignore, violate or subvert them in the interest of unrestrained government by ‘the people’. Lisa Louwerse and Eva Kassoti offer a thorough analysis of the development of rule of law accession conditionality since 2004. They argue that the Commission’s accession policies focus too heavily on the acquis and less on the introduction of formal characteristics of the rule of law. They also note an increased sensitivity of the Commission to the underlying societal and cultural transformation that a robust rule of law requires. They conclude, however, that this commitment to the cultural dimension of the rule of law is mostly lip service; it has not yet been incorporated in the accession methodology. In the EU a series of mechanisms and procedures—(pre)-Article 7 TEU, infringement procedures before the Court of Justice, the Justice Scoreboard—are currently being deployed to try to counter the rule of law decay in EU Member States. Many more mechanisms and procedures are being proposed and discussed. Yet a thorough analysis of the inner stuffings of democracy that cause rule of law decay is at least just as important. That is to say, again in Zakaria’s words, the problems of governance in the twenty-first century are problems within democracy. ‘This makes them more difficult to handle, wrapped as they are in the mantle of legitimacy’. We hope that this Special Issue offers useful perspectives on the challenges that accompany this deceitful ambiguity. The Rule of Law as an Institutionalized Wager: Constitutions, Courts and Transformative Social Dynamics in Eastern Europe, 1 Hague Journal on the Rule of Law (2), 2009, 263–283, 270. A. von Bogdandy and P. Sonnevend (eds. ),Constitutional Crisis in the European Constitutional Area, 2015, V. Perju, The Romanian double executive and the 2012 constitutional crisis, 13 International Journal of Constitutional Law (1), 2015, 246–278; P. Blokker, Constitution making in Romania: from reiterative crises to constitutional moment, Romanian Journal of Comparative Law, 2013, 187–204; L. Pech and K.L. Scheppele, Illiberalism Within: Rule of Law Backsliding in the EU, Cambridge Yearbook of European Legal Studies, 2017, 3–47. See also the 2018 special issue of this journal on the Crisis of Constitutional Democracy in Central and Eastern Europe, edited by Jernej Letnar Černič and Matej Avbelj. R. Markowski, Creating Authoritarian Clientelism: Poland After 2015, Hague Journal on the Rule of Law, 2019(1); W. Sadurski, How Democracy Dies (in Poland): A Case Study of Anti-Constitutional Populist Backsliding, Sydney Law School Research Paper No. 18/01, 2018; W. Sadurski, Poland's Constitutional Breakdown, 2019 (in press); W. Sadurski, Polish Constitutional Tribunal Under PiS: From an Activist Court, to a Paralysed Tribunal, to a Governmental Enabler, Hague Journal on the Rule of Law, 2019 (1); Commission’s Reasoned Proposal in accordance with Article 7(1) of the Treaty on European Union regarding the rule of law in Poland: Proposal for a Council decision on the determination of a clear risk of a serious breach by the Republic of Poland of the rule of law, COM(2017)835 final. The workshop and debate were funded by Vfonds, Tilburg University and Access Europe (University of Amsterdam and the Free University Amsterdam). The public debate, with Adam Czarnota, Radek Markowski and Wojciech Sadurski, can be viewed at https://debalie.nl/debalie-tv/democracy-in-europe-what-about-poland/#. Democratic Decay: Conceptualising an Emerging Research Field, Hague Journal on the Rule of Law. https://doi.org/10.1007/s40803-019-00086-2. Constitutional Markers of Authoritarianism, Hague Journal on the Rule of Law. https://doi.org/10.1007/s40803-018-0081-6. R. Uitz, Can you tell when an illiberal democracy is in the making? An appeal to comparative constitutional scholarship from Hungary, International Journal of Constitutional Law, Volume 13, Issue 1, January 2015, 279–300. Polish Constitutional Tribunal Under PiS: From an Activist Court, to a Paralysed Tribunal, to a Governmental Enabler (forthcoming). 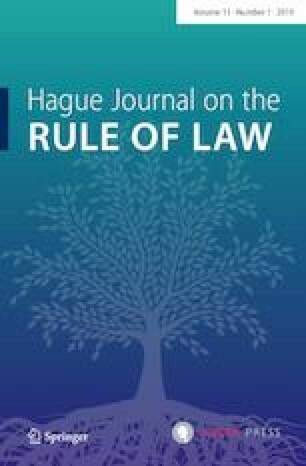 Hague Journal on the Rule of Law. https://doi.org/10.1007/s40803-018-0078-1. ‘What is Going on in Poland is an Attack against Democracy’, Interview with Wojciech Sadurski by Maximilian Steinbeis, 15 July 2017, VerfBlog, 2016/7/15, https://verfassungsblog.de/what-is-going-on-in-poland-is-an-attack-against-democracy/. http://dx.doi.org/10.17176/20160718-104348. M. Kammen, A Machine That Would Go of Itself: The Constitution in American Culture, 1986. See especially the debates on Verfassungsblog and C. Closa and D. Kochenov (eds. ), Reinforcing the Rule of Law Oversight in the European Union, 2016; A. Jakab and D. Kochenov (eds. ), The Enforcement of EU Law and Values: Ensuring Member State Compliance, 2017. Proposal for a REGULATION OF THE EUROPEAN PARLIAMENT AND OF THE COUNCIL on the protection of the Union's budget in case of generalised deficiencies as regards the rule of law in the Member States, COM(2018) 324 final. The Rise of Illiberal Democracy, Foreign Affairs 67/6 1997, 22–43. The Future of Freedom. Liberal Democracy at Home and Abroad New York, Norton and Company, 2004.